As children grow up, their needs increase, and so does the financial backing for them. So how do you make sure you can give them the best possible future? Ideally, you need to start saving for them as soon as they are born or even earlier. But if you haven’t already, it isn’t too late. This Children’s Day the best gift you can give your child is a secured future. Here are the different ways you can do this. Although a gift in the form of cash is always welcome, offering a monetary gift for a specific purpose would make more sense. It could be for a down payment they need for a loan or to repay a monthly installment for rent or student loan. Either way, this gift will not only make them happy but can help them out financially. Related: How prepared are you to meet your child''''s education cost? These accounts function much like regular bank savings accounts. A Child Savings Account can help you teach your kids the importance of managing finances, while simultaneously saving up for their future. This kind of account can be opened for kids below 18 years of age. 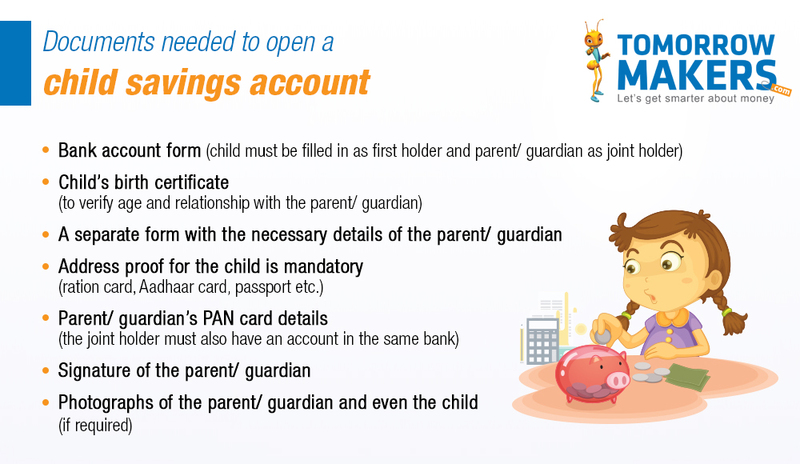 When the child reaches 10 years of age, he/ she is provided with a debit card and cheque book, and can operate the account. However, as a parent/ guardian, you can set limits on the withdrawal amount. For instance, some bank accounts like Kotak Mahindra Junior Account is designed to inculcate a habit of savings in children. It also offers benefits and discounts on dining, edutainment and several kids'''' brands. Additionally, it currently earns interest of up to 6% p.a. A child insurance plan can give your children financial backing, by providing them with a lump sum amount in case you and your spouse suffer an untimely death. In addition to this, any future premium will be waived off and the insurer continues to reinvest the money. Bear in mind, your children’s life is not insured in this plan, but yours is. So, if you haven’t already, get a child insurance plan to safeguard your child’s future. Some child plans you can consider are Aegon Life iMaximize insurance plan, HDFC SL Young Star Super Premium and ICICI Prudential Smart Kid Solution. Such investments can be used for various purposes, such as funding your child''''s future education costs. If you are not sure of how much you would need for this, you can use an education cost calculator to get a better idea of how much you need. This calculator also takes into consideration the inflation rate to ensure you meet every expense. Investing in stocks or IPOs for your children is another smart gift you can give your child. Of course, you would have to start this process for them. But eventually, they can learn to manage it themselves. Along with making them self-dependent, by teaching them about investing, and the risks and returns involved in it, you can make them financially smart adults. If you have a daughter, you can consider getting a Sukanya Samriddhi account in her name. It aims to improve your daughter''''s future by offering financial security and independence. The scheme was started by the Indian government with an intention to meet the educational and marriage expenses of a girl child. This account can be opened anywhere in India before your daughter turns 10 years old. The minimum deposit can be as low as Rs. 1000 or as high as Rs. 1.5 lakhs per year. Currently, this scheme has one of the highest interest rates among government-sponsored schemes i.e. 8.3%. Related: Sukanya Samriddhi Scheme: What is it and how it benefits the girl child? Children seldom enjoy these kinds of gifts. Beware, your kids might not seem entirely thrilled with some of them initially. However, they will realise the true value of such gifts in the long term and thank you for it then. So, do something different for your kids this Children’s Day. Take advantage of the opportunities available to you and secure their future today.